This is seriously problematic and we think that it’s about time people send E-mails to people with actual leverage over the autocrat. New Year’s eve seems like a good point for New Year’s resolutions and holding Battistelli accountable is a well overdue cause. I would like to thank you for all the excellent work you have done this year, again. You are nearly the only independent source of information on EPO related matters. 2017 has been decisive in the “perception” of how despotic, incompetent, ruthless, corrupt etc. the management of Team Battistelli is. However a public perception of the problematic doesn’t bring directly a solution to recover a full-functioning EPO. Team Battistelli is like cancer: stronger healing protocols, similar to chemotherapy and surgery, will be unavoidable, And it is not clear that this office may ever return to a normal state of affairs. If you have time you may watch the videos of the town council meetings in St Germain en Laye where M. Battistelli is a town councilor and deputy mayor (in charge of culture!). It is remarkable to see that the otherwise big mouth has nearly nothing to say in a democratic context! You may have a look here. When watching the videos, I was impressed (I really mean it) by the polite and friendly tone of the Mayor and generally of the town councilors. What a disparity with the perceived constant lack of education exhibited by Team Battistelli. Yes another world is possible. 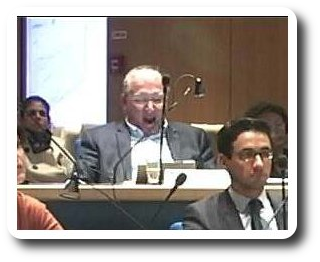 Certainly not all town councilors are aware that the person in the last row is de facto a criminal not sitting behind bars because he claims and enjoys (diplomatic) immunity. He was elected 6th deputy mayor in charge of culture during a vote held on 19.10.2017 in a session of the town council. Watch the ballot count. The election was far from being unanimous. Many blank and spoilt ballots. I guess that the councilors from another political side didn’t vote for him. I firmly believe that transparency is of the utmost importance and that the councilors should be aware of the existence of Techrights. Here a comprehensive list classified by political groups. To be noted: Mr. Battistelli belongs to group n°. 1 “Union pour St Germain”.